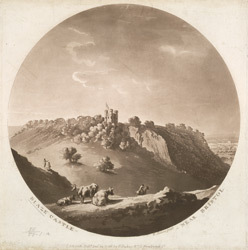 View of Blaze or Blaise Castle near Bristol. This is actually a Gothic style garden folly, built as a home for a wealthy merchant venturer from Bristol called Thomas Farr in 1766. (Farr, later became Mayor of Bristol). As can be seen in the print, the it is perched romantically on a rocky, wooded cliff top in the middle of an estate. There was an Iron Age Fort here. Unfortunately Farr became bankrupt by 1778, and his estate passed through several hands until it was bought by John Harford, a Quaker banker, who built the Blaise Castle House, a separate Georgian mansion on the same estate.